Run your marketing function as a business and the marketing budget as an P/L statement. Pay equal attention to marketing strategy and marketing operations. Derive all marketing objectives from the business objectives, illustrate how they link, and then translate into marketing tactics. Pay attention to both maneuvers and means. Maneuvers = what we need to do in the market. Means = what we need to do internally to execute the maneuvers. Drive a business mind-set in your team(s) and expect insight to all key business functions – supply chain, sales, customer service, IT, engineering/design, etc. Start with process and briefings. You can get a long way by establishing a marketing process that links directly with the corporate planning process, go-to-market process and other core business processes, and by improving the briefings to internal and external partners such as product design, communication, agencies etc. Establish regular, structured market visits to local offices, stores, suppliers, customers, and competitor touch points. Document and share learnings. Use simple planning tools that you and your teams can use to plan long-term as well as activate on a daily basis for everyday direction. Strategy maps are often a good tool for this. Check out Cases for stories on marketing performance. 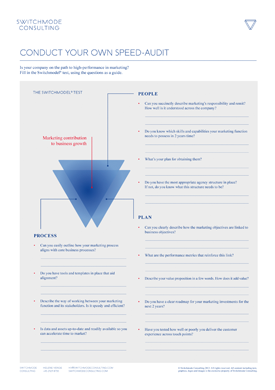 Or do a speed-audit of your company’s marketing practice with the Switchmodel® test below. Are you on the path to high-performance in marketing? Download the Switchmodel test as PDF and fill it in for your company, using the questions in the model as a guide. Don’t hesitate to get in touch if you have questions/comments or would like a walk-through of the Switchmodel test.